Please note: The start time for this event has been changed from 7:30 pm to 8:00 pm. Start your Saint Patrick’s Day celebrations early with three of the funniest comedians of Irish descent Boston has to offer. Jim has been featured on Comedy Central, Comcast Comedy Spotlight, NBC’s “Last Comic Standing,” Line at Gotham AX TV and “Roughing It” on NESN in his native New England. Jim also founded and currently runs The Boston Comedy Festival. Since 1999 Jim has also entertained U.S. troops at more than 100 bases around the world. An account of his experiences performing for the troops has recently been published in Embedded Comedian which Jim describes as a “field manual for comedians in a war zone.” Founder of the Boston Comedy Festival. Joey has used his comedy to bring much-needed laughter to our troops overseas since 1999. Joey has appeared in Celtic Pride. Joey was featured in NESN’s Roughing It and WCVB’s Chronicle, as well as Comedy Central’s Pulp Comics and lastly on NECN’s Broadside with Jim Braude. Featured performer Boston Comedy Festival. Kendra Cunningham is a Boston-born stand-up comic, comedy writer, actress, and filmmaker living in Brooklyn, where she owns a super comfortable bed. She also bartends and has an MA in Forensic Psychology. Kendra spends most of her time wondering where the hell her sugar daddy is and hoping he didn’t settle. Kendra regularly contributes to The Huffington Post and the comedic relationship blog Beauty and the Beast. Her short films have been screened at a number of festivals; Lonelygirl48, which she wrote and acted in, won the Boston Comedy Festival and the Palm Beach Women’s International Film Festival. She has been featured in Time Out New York and on CNN Money, among other publications. Mary Connolly preserves the traditions of her Irish heritage through dance. Her parents were born in Galway and met at an Irish Social Dance in Boston. Mary started Irish step dancing at age 6 and has fond memories of attending Irish Socials with her parents. She competed and won many medals for her step dancing at Boston competitions. Mary has been teaching Irish Step, Ceili and Set Dance to children and adults in the Upper Valley since 1996. Her students have performed at many local festivals and shows. She produces an annual Ceili, a traditional music and dance party open to the community. 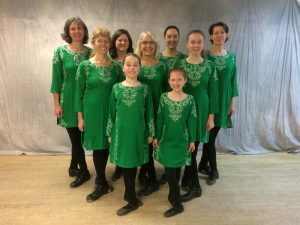 The Connolly Celtic Dancers can be seen “stepping out” at various St. Patrick’s Day venues. Mary continues to study Irish Dance, participating in workshops throughout the year, passing the tradition on to her students. 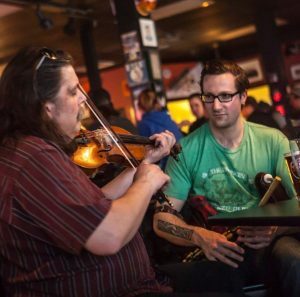 Traditional Irish music featuring fiddler Roger Burridge and piper Anthony Santoro. Born into an English family with deep roots in folk music, Roger Burridge ventured over to Ireland in his late teens. That experience ignited a lifelong passion for playing traditional Irish dance music. Burridge has recorded and played alongside some of the very best Irish and English musicians. Now living in New Hampshire, Roger is joined by piper Anthony Santoro to produce rich, energetic, raw, foot-stomping music. Infatuated with the Irish uilleann pipes from an early age, Santoro has toured Ireland, New England, New York, and lived and performed in Las Vegas. The duo has now performed together for over a decade.